I love baked bean and cheese toasties. The crunch of the toasted bread, the tomatey goodness of the beans and the deliciously gooey cheese are a perfect combination. I also love pizza (I mean who doesn't, right!) and then the other day while searching in my kitchen for something to eat I had a brainwave. 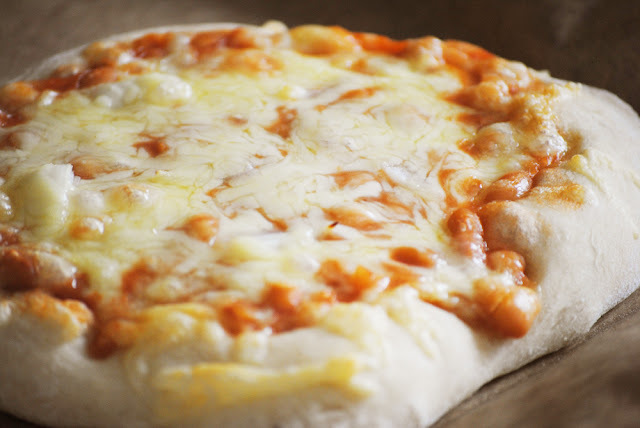 Why not make a Baked Bean Pizza!! A nice twist on two classics. Once you've made the pizza dough (Jamie Oliver has a good recipe -the semolina gives the base extra crunch), it's super easy. Just spread out your beans, top with grated cheese and bake like normal. For an extra flavour boost, diced onion and ham/bacon sprinkled onto the beans is delicious!